Shocking pictures show an abandoned dog so emaciated that she couldn’t stand up. The Staffordshire Bull Terrier named Ayma was discovered early on Friday morning in North Shields, Tyne and Wear. 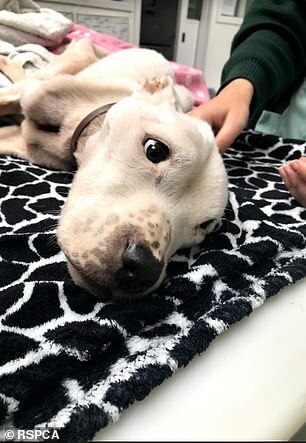 She was treated at the vets and given much-needed food and fluids, but they could not save her life and she was put to sleep last night when her condition deteriorated. The RSPCA are investigating the case. Cathy Maddison, an inspector at the charity, said she was shocked that the neglected pup was still alive when she was found given the extent of her starvation. Read more here…WARNING disturbing photos and video. In this life we don’t have to own a dog ~cat ~Horse. So why the hell do people have a dog . There is no respect for life. I just hope that what goes around comes around .